"We always wonder if we killed the right people, if we endangered the wrong people, if we destroyed an innocent civilian's life all because of a bad image or angle." 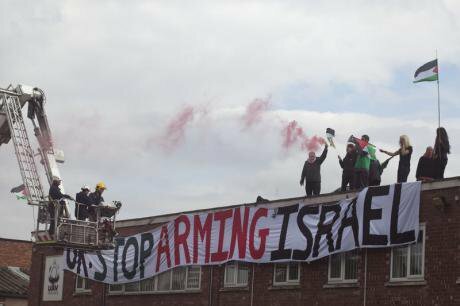 London Palestine Action protesters shut down Elbit Systems factory. Credit: Demotix/Lee Harper. Yesterday Baroness Sayeeda Warsi resigned from the UK government in opposition to its uncritical support of Israel, while Scotland's First Minister Alex Salmond called for an embargo on all arms sales to Israel. In Birmingham activist group London Palestine Action successfully shut down and occupied a factory owned by Elbit Systems, Israel's largest arms company. Mass demonstrations taking place across the world have shown a deep well of public support and solidarity for the people of Gaza. Spain is the first European country to freeze arms sales to Israel. A broad and growing opposition to Israeli militarism is developing. Despite this, other European governments have so far refused to follow suit. The UK has indicated that it will review all active arms licences to Israel, but, despite widespread pressure, there has been no formal announcement. Schleifring Systems are not a household name, but by now many people will be familiar with the deadly consequences of their work. The UK-based company makes components for armoured vehicles, weapons stations and missile launchers, alongside other weapons. It is one of a number of international arms companies that has contributed to the Hermes drone, a deadly aerial weapon that has been used on Israel's attacks on Gaza. Over 800 Palestinians have been killed in drone strikes since 2006, and that number is steadily increasing in the current bombardment. Far from being the intricate weapons that they are presented as, drones are often inaccurate and dangerous. They are operated remotely by fallible human beings who are making life and death decisions based on fuzzy images and unclear pictures. “We always wonder if we killed the right people, if we endangered the wrong people, if we destroyed an innocent civilian's life all because of a bad image or angle,” one former drone operator wrote. The Hermes drone is just one of the number of the drones being used in conflict with Gaza. It is produced by Elbit Systems, which was promoting its 'battle tested' wares at the Farnborough International Airshow earlier this month and has recently been awarded a $145 million contract to monitor the US-Mexican border. Military collaboration and the sale of weapons are not politically neutral moves. Arms deals don't just give Israel military support, they also bolster the government by sending out a strong message of political support. It is a support that can have deadly consequences, as we have seen when UK weapons have been used against pro-democracy campaigners in Egypt, Libya and Bahrain. Despite these terrible precedents, there are a number of European arms companies that are still contributing to Israel's military arsenal including components for US-built equipment destined for Israel. As long as Europe continues to give its unconditional military and political support to Israel then it has to bear a degree of responsibility for the ongoing conflict. Israel buys large quantities of weapons from Europe, including £10 million a year from the UK, around €50 million a year from Germany and similarly large amounts from France. It also enjoys growing military relationships with Spain, Italy and Romania in particular. In total EU countries have licensed almost €2.5 billion worth of weapons to Israel in the last decade, including military vehicles, small arms and weapons firing equipment. Israel is a large arms buyer as well as a seller. Its long and enduring military relationship with the US is well documented. Following a Bush-era agreement, US weapons exports to Israel are scheduled to total $30 billion from 2009-2018: this represents an annual average increase of 25 percent above previous levels. The Obama government has continued this long standing policy, and has also commissioned major arms deals to sell advanced missiles and fighter jets. Unlike Hamas, which is constrained by the ongoing blockade and allegedly relies on neighbouring countries, including Iran, for its arms, Israel has a very advanced arms industry. There are over 200 arms companies in Israel and the government has spent over $18 billion on weapons in the last 12 months. Unlike Gaza, it also exports a lot of weapons, with $7.5 billion worth of exports in 2012 alone. In 2009, David Miliband, the then UK Foreign Secretary, confirmed that Israeli equipment that had been used in Gaza in the 2008-9 conflict “almost certainly” contained UK-supplied components. There is every reason to think that this is still the case today. Successive UK governments have licensed a further £50 million worth of arms to Israel and have ruled out an investigation into whether UK components are being used in the current aggression. Alongside arms sales, there is also a close level of military collaboration. In 2012 Italy and Israel signed an agreement for 'cooperation in defence technology'. Similarly, Elbit Systems has signed an agreement with UK arms company, Thales UK, on a Ministry of Defence contract worth nearly £1 billion for the development of Watchkeeper WK450 drones. The aim is for these drones to be exported from 2015 onwards. The EU policy is laid out in the EU/Israel Action plan, which states: “Israel and the EU will strive to intensify political, security, economic, scientific and cultural relations, and shared responsibility in conflict prevention and conflict resolution.” Despite these rather heady words the arms sales and military collaboration has only continued, with EU nations taking a back seat, largely staying silent on Israel's actions. Current UK policy is merely a continuation of a long term pattern of political and military support for Israel. This was highlighted in February 2011 when foreign office minister Alistair Burt wrote: "UK policy on the export of controlled goods and equipment to Israel has not changed since the Coalition Government took office. All export licence applications to Israel are considered on a case-by-case basis against the Consolidated EU and National Export Licensing Criteria.” This says very little – the real issue is how the criteria are interpreted. In July 2002, the UK government approved the export of components for F-16 fighters being made by the US company Lockheed Martin and sold to Israel. Over the last few years Israel has used F-16 fighter aircraft and Apache combat helicopters to bomb Lebanese and Palestinian towns and villages, in wars which have killed thousands of people. These deadly weapons have contained European manufactured components including missile triggering systems for Apaches and Head-Up Displays for F-16s. Earlier this month, Philip Hammond, the UK foreign secretary, said of Russia's support for separatists in Ukraine: “They have been supplying them, they have been supporting them... They cannot deny their responsibility for the acts that these people are carrying out." He is right, but the same must be said of the support of western governments for Israel's collective punishment and destruction of Gaza.